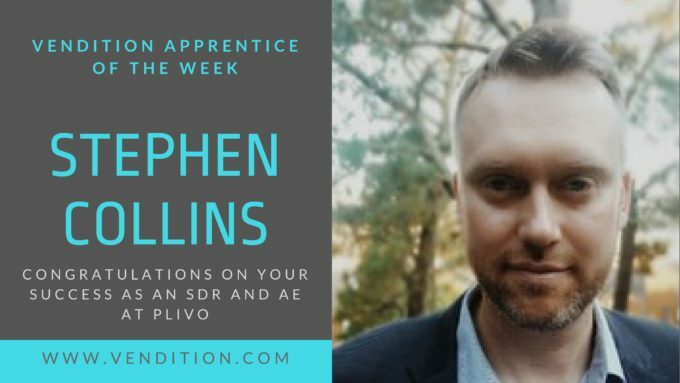 This week, we are highlighting Stephen Collins at Plivo as Vendition’s Apprentice of the Week. Stephen first started working with us back in 2017 and found his fit at Plivo. Since then, he’s moved from SDR to AE and continues to see day-to-day successes in his sales career. It was just a matter of connecting him with the right company, when it comes down to it. Stephen said, “I could tell right away that Plivo was a great team. Everyone was very approachable, enthusiastic about what they did, and engaging. The product was a big draw too– it’s a need-to-have product that is useful for almost any industry. Basically anyone that uses text message and calling capabilities in their application. But mostly it was the team and culture here at Plivo that got me excited. We’re so happy to hear of your success, Stephen, and we’re excited to see what’s yet to come for you at Plivo.